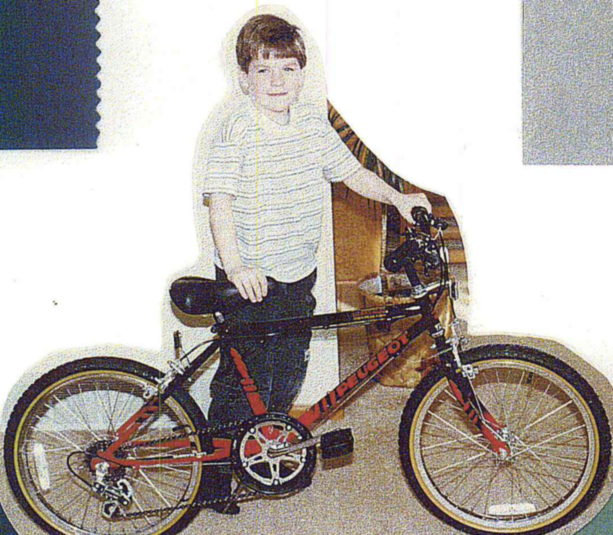 My first bike was a 20” BMX-style bike, a Schwinn Predator. 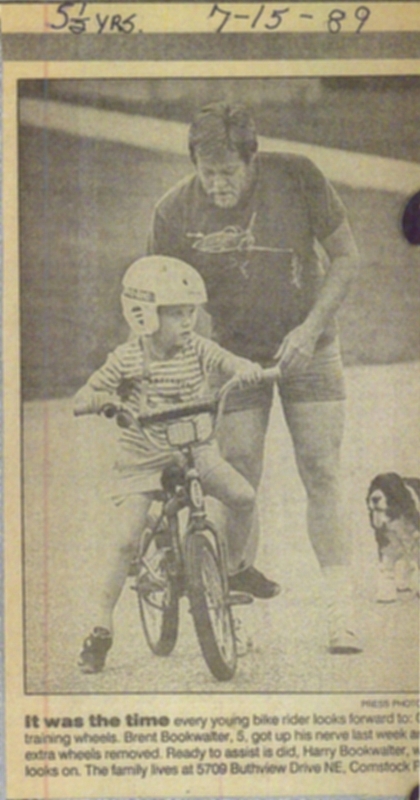 I rode it with training wheels at first, and it was the bike I learned to ride without training wheels on. I remember learning how to ride in the yard around our house, at a park, or on a neighborhood street. Our driveway had quite a steep hill, and our street was also hilly, so it was all about either going up or down. One day, a reporter from the local paper stopped and asked to take some pictures of my dad and I. The picture ran in the paper the next day as a “sight of spring” image. My next two bikes were more “mountain bikes.” A Peugeot Lizardhead followed by a Trek 800 Antelope. They were my first bikes with gears and the ones I rode when I started to explore and get on some mountain bike trails. My first real mountain bike trail was on the Trek 800, and I was super excited! I had ridden some trails through the local forests and fields but never on a specific MTB trail. Our next-door neighbor, Brian, was into mountain biking and had a crew of guys that rode the local trails. They took me out to Cannonsburg Ski Area (the same ski hill I lived on during the winters) and had a few miles of trails. I was worried I wouldn’t be fast enough to ride with them or not having the skills to handle the downhills, but immediately I enjoyed it and wanted to go back. Around 12 or 13, I switched over to clipless pedals. There were definitely a few tip-overs, but it didn’t seem to slow me down and pretty soon, I was hooked. Looking back, I probably should have waited to be attached to the bike as my skills really developed after that and I was a mess if I ever rode on flat pedals. As a kid, I liked working on my bike but always liked riding it even more. Over the years, I worked at a couple of different bike shops and fortunately had some very patient teachers that help me learn the basics. At those jobs, I typically was relegated to building the kids bikes or more entry-level bikes, but this got me familiar with the basics. I rarely received a paycheck because every dollar I made was immediately spent buying new gear.